Cleaning your windows takes you a too much time and exhausts you? You can make a change now – just contact our representatives and book our window cleaning in Temple Mills. We will deal with this matter for you and the results will be appropriate for each part of your windows – glass surfaces, framework and sills. With our support, you will have the flexibility to do everything you want with the time you for the most part spend for window washing. But our services will bring you even more, as you can see from our list of advantages. We also provide our professional services in nearby areas: Pudding Mill Lane, Stratford, West Ham, Maryland, Blackwall. We provide first class window cleaning by using latest equipment. We deliver gleaming and spotless look for your glass surfaces, roof windows and greenhouses with water-fed extension pole system and jet washing. The poles we use are attached to water supply in our vans, thus eliminating the risk of damage to the exterior of your home or business premise. In addition, we use totally safe rope access techniques to clean glasses on high-rise buildings. You can benefit from these techniques now – give us a call on 020 3746 3113! Improve the look of your office – the professionals of commercial window cleaning will take care of that. As part of our specific service, we use water-fed extension poles. 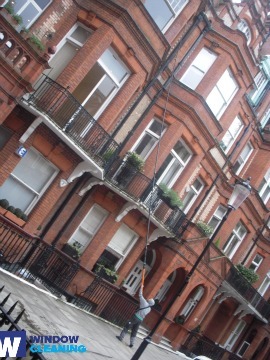 With this technique, we can clean completely the windows of your business premise, up to the fourth floor. In order to reach highly-rised windows we use rope access. We grant your glass panes will look great, regardless how high is the building. With the help of the team of experts London's skyline will never be dusty. The employees have the abilities and the needed equipment to provide you with both private and commercial window cleaning. You can depend on us for every kind of glass surface cleaning. For example, we can clean small or double windows, French doors, sash windows, patio doors and bay windows. Furthermore, if you have garden glass surfaces, conservatory or roof windows, we can clean them too. We use the latest techniques and the most advanced equipment for all the previously mentioned window types. Request our window cleaning in Temple Mills for your home. We will use mentioner earlier techniques – water fed extension pole system for easy-to-reach windows and rope access tools for higher ones. For the entire service we use purified water. Request a cleaner today – ring 020 3746 3113 and speak with our call centre staff. Or you can fill in our on-site booking form or use our chat option.